THINK BEFORE YOU SHARE or REPLY – just use your head! Beware of deceitful Facebook users who are posting (FAKE) pictures of sick, starving, dead and injured children, adults or animals on Facebook, to trick other Facebook users into commenting on them by typing “Amen,” in order to make them popular. This type of activity is another Like-Farming scam. The heartless and deceitful people who are tricking Facebook users into typing “Amen” are only taking advantage of caring Facebook users, who think they are helping out, by playing with their consciences. The scam may also ask Facebook users to compliment a child, an adult or an animal, or type “Amen” to be grateful for something. It is important to remember that commenting on fake Facebook posts will only help to make the posts popular, which the owners, mostly scammers, will sell to rogue online marketing companies or other scammers, with the publicly available information of all the Facebook users who commented on them. Once spammers and rogue online marketing companies have received Facebook users’ information, they will start sending them hundreds of spam (unsolicited messages) and phishing links that will take them to fake websites to steal their information, or malicious links that will take them to dangerous websites that will infect their computers with Spyware or Trojan horse. The scammers may also send fraudulent messages claiming that their potential victims are so-called lottery winners and they need to send money in order to claim their prizes. Money and Religion – figures! You could end up having your account cloned, some are used for scams, some are simply to make the account popular and it is then sold to a band/ model etc or just put up for auction, funding more of the same, and it’s all because people SHARE this rubbish! You should NOT type ‘amen’ in posts, such posts are not always from hackers that can somehow magically hijack your account just because you comment. 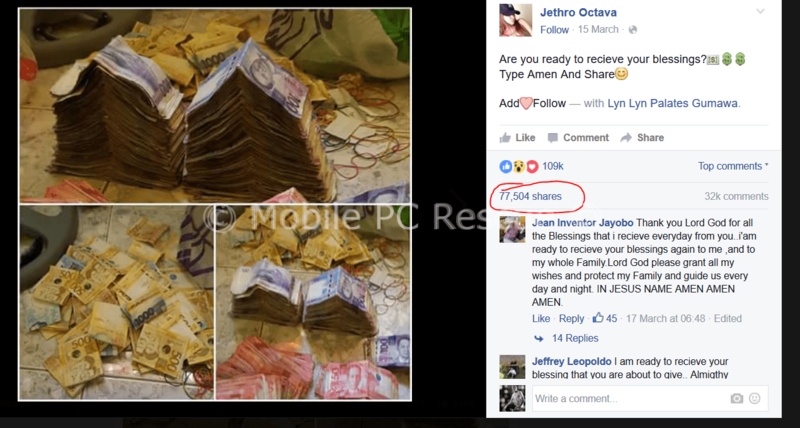 Instead, posts claiming that you can help a pictured child or animal by liking, sharing, and commenting ‘amen’ are like-farming scams. The images used in these scam posts are stolen from other websites and used without permission or they are faked to get your attention. Typing ‘amen’ and sharing the posts will do nothing whatsoever to help the pictured child or animal. But, while entering ‘amen’ on these scam posts certainly plays into the hands of like-farmers and should be avoided, the act will NOT allow even the cleverest hacker to take over your Facebook account, but if you post PUBLIC it can make you a target for having your account cloned – See here: PUBLIC POSTING DANGERS – Moreover, having seen hundreds of such posts in recent years, I can assure you that they are not all posted by ‘foreign men’. Such scams are perpetrated by both men and women from all over the world. And, of course, whether or not a person can be considered ‘foreign’ depends entirely on where you happen to live. If you’ve been in the business of typing AMEN or YES to such posts on Facebook or any other social media forum, then I’ll advice you to stop it, if for no other reason, it makes you gullible and shows how quick you are to fall for a scam without giving it thorough thinking. How do you explain one like equating to 100 prayers? Which god answers such prayers? Does he REALLY use Facebook?